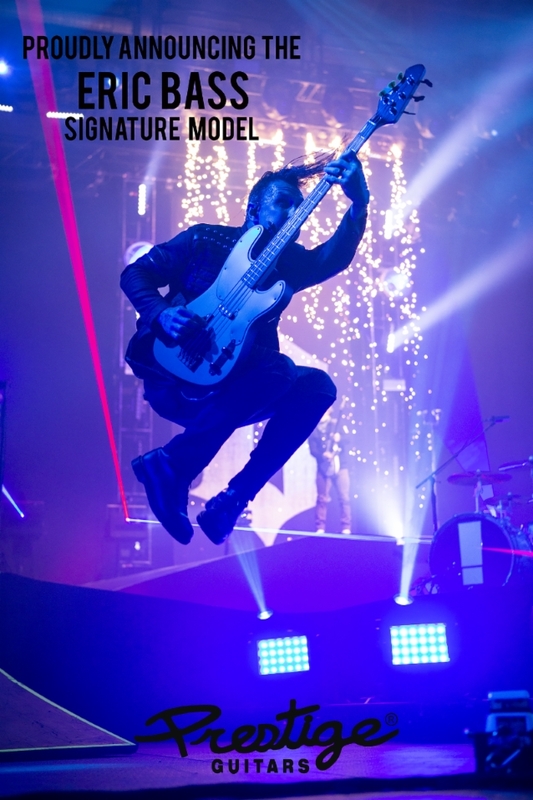 Eric Bass of SHINEDOWN and Prestige Guitars Ltd. have announced the launch of the Prestige Eric Bass Signature Bass. The Eric Bass Signature Bass will be unveiled at the 2019 NAMM Show — a global gathering of the music, sound, and event technology industries — at Anaheim Convention Center in Anaheim, California which will be held from January 24 to January 27. The Eric Bass Signature Bass will be showcased as part of NAMM Media Preview Day on Wednesday, January 23 from 3 p.m. to 5 p.m. where 50 exclusive products will debut ahead of the event weekend. The official unveiling will take place on Thursday, January 24 from 11 a.m. to 11:30 a.m. at Prestige Booth 3321. Eric Bass will also appear for a signing on Saturday, January 26 from 1 p.m. to 2 p.m. at Prestige Booth 3321. The Eric Bass Signature Bass will be available immediately for purchase through Prestige dealers and direct through www.prestigeguitars.com. The Eric Bass Signature Bass will feature an offset, double cutaway solid Ash body, with bolt-on, one-piece hard maple neck. The body has a flat top and back in order to increase the body mass resulting in huge punchy tone and tons of sustain, there is a thinner neck profile for faster action and increased playability. Pickups and hardware will include a Seymour Duncan Quarter Pound single coil pickup for aggressive attack with strong bottom end and more mids, Hipshot 4 string A-Style Bridge and Hipshot HB 7 Tuning Machines. The bass will be released with two finish options; Satin Trans Dark Red with black binding and matching black pickguard, and Satin Arctic White with Mother of Pearl Binding and matching Mother of Pearl pickguard. Full specs are below. Eric Bass exclusively plays Prestige acoustic guitars. Prestige has served as his main acoustic since the entire U.S. leg of the band’s “Threat To Survival” tour in 2015. SHINEDOWN will kick off its headlining “Attention Attention” tour on February 20, with additional tour dates set through 2019. The group will perform its powerful anthem “Get Up” on “Live With Kelly And Ryan” on January 23.